Property Size 2,188 sq. ft. Welcome to the new Palm Springs Modern. Designed by noted Palm Springs Architect James Cioffi, this home is positioned to take full advantage of the mountain views to the west and the privacy of three private outdoor areas situated around the property. Let the contemporary décor welcome you as you enter this bright and airy, 3BD/3BA, 2,188 sq. ft. home with 2-car garage and ample off street parking. High ceilings, a wall of sliders and large windows throughout make this home a bright and welcoming retreat all year round. The open great room floor plan with dining area and kitchen perfectly incorporates the indoor and outdoor living that has become synonymous with Palm Springs living. Just one step and you are able to enjoy this comfortable and private patio perfect for morning coffee or take a few more steps to a full patio that allows you to lounge poolside day or night with resort style pool (pool heat is an optional/additional charge. See house rules for additional information) and spa and a fire pit with ample seating to enjoy sunsets or after dinner lounging. The amply stocked kitchen is ideal for the experienced cook or the novice chef. Your friends and family can relax in the great room or marvel at your skills as they pull up to the kitchen bar as you prepare your meals. The great room offers comfortable and stylish seating for relaxing, entertaining or catching the big game on your wide screen 60” smart UHDTV. High speed wireless internet and cable include a Preferred TV package featuring more than 200 channels, Netflix and extreme internet with 30 mbps and unlimited home phone (with free long-distance calling nationwide and to Canada). The master suite is your own stylish retreat. Both light and bright yet comfortable and relaxing the suite features a King bed, a 50” Smart UHDTV and direct access to the pool and fire pit. The master bath is its own private sanctuary with soaking tub, large walk in shower and spacious walk in closet. The second bedroom offers a queen bed. Light and bright, this bedroom is high on style. The bathroom, conveniently located across the hallways offers a spacious walk in shower that any guest will appreciate after a day of exploring all that the Coachella Valley and the Palm Springs area. The third bedroom, a second master suite with its own ensuite bathroom, bright striped walls and colorful art is perfect for those looking for maximize on space while not giving up on the comfort for their other guests. Offering a king bed, 50” Smart UHDTV and an oversized walk-in closet, dual sink vanity, and large walk-in shower, this room will please any guest. The sparkling pool (pool heat is an optional/additional charge. See house rules for additional information) and spa, and alongside the outdoor fire pit make outdoor living a breeze. Luxuriate in the pool,tan on the pools’ tanning shelf or poolside in a lounge chairs or just relax around the fire pit when the temperatures start to cool. With 48-hour notice prior to arrival, a child pool safety fence can be erected to protect the younger visitor. The outdoor patio also has a comfortable dining table for eight conveniently out of the suns’ rays and a large gas grill for outdoor dining. There is a second patio off of the great room that make morning or quiet moments a bit easier away from the sun and splashing of the pools’ activities. Just a short drive to downtown Palm Springs, with its many attractions, shops, restaurants, and art galleries, you are never that far from partaking in what the city has to offer. Other Palm Springs attractions are never that far away, from area casinos, to world-renowned sporting attractions like the BNP Paribas and ANA Inspiration (formerly the Dinah Shore Classic), and the Palm Springs Aerial Tramway; in Palm Springs there is something for everyone. Murano is a unique neighborhood in Racquet Club Estates. It's an area full of custom architecture, just steps away from the historic Mid Century homes of the Racquet Club Estates neighborhood. It should be noted the city has sound ordinances that are strictly enforced. The owner(s) like to stress this home is ideal for a dream vacation and relaxation but is by no means a “party-central” home. Each guest is expected to be as good a neighbor as the owner(s) themselves. Special events like weddings are NOT allowed. Fabulous Great property, great view, great location, but SHHHHHHHHH! don't tell anyone. I wouldn't want it it to become too booked up so I can't get it again. A modern home, recent build, beautifully equipped and within easy distance of Downtown Palm Springs (while being far enough away to be quieter and so perfect for peace and quiet). Hosts Scott and Chris were fantastic - super responsive and a comprehensive check-in. We'll be back! Intriguing Mid-Century Modern We stayed here in January with another couple. The home is located at the end of a quiet cul-de- sac. It contains 2 master bedrooms with en suites, as well as a smaller third bedroom. There is an additional full size bathroom. The kitchen is well appointed with high-quality appliances. There are 2 patios and we made good use of both. The decorating was fun and definitely different than the other (many) homes we have rented. We were very pleased with this home and would recommend it to others. PS Enamor is an awesome house with plenty of space to make three couples or individuals using the house's three bedrooms have plenty of privacy. We found the house exactly as it was described - everything you'll need to cook, or enjoy cocktails is provided! The house felt private and we appreciated the quiet neighborhood. The location is good, if not walk-able to central Palm Springs - a 10 minute drive or uber. The number one thing to be aware of is that this location can be very windy as it is in northern Palm Springs, closer to the valley entrance. At times, this made enjoying the pool area a little tricky, but overall not a deal breaker! Comfortable- great location - clean We had a great time. The folks running the place were very helpful and friendly. We had everything we needed. Most Excellent! The five of us had a wonderful week at this beautiful home in Palm Springs. The home meets and/or exceeds its description in every way. We especially enjoyed the pool and hot tub (pool heat is a must in the winter months) as well as the huge patio and numerous lounge chairs for sunbathing. This place has stunning views of Mount San Jacinto, and the property is beautifully landscaped. It was nice to have a grill to BBQ as well as an outdoor table to dine outdoors in the beautiful evenings. The fire pit was awesome to sit around and chat at. There is also a separate patio on the opposite side of the house with comfortable seating - perfect to soak up the morning sunshine with a cup of coffee. Indoors, the place is bright, airy, and comfortably decorated. The kitchen is well-equipped with lots of pots/pans, cooking utensils, and dishes. There's tons of counter space, a large gas range, big fridge, various small appliances, and a bar set. It was really nice to have a bathroom for each bedroom. Beds and pillows are firm but decently comfortable. The house has a large dining room table, and lots of seating in the living room, which is equipped with a big Smart TV and gas fireplace. There is plenty of space for everyone; even with 5 adults, it never felt crowded. The home was very clean upon arrival, with lots of linens, including pool towels, for all. An added bonus was having a washer and dryer to use during our stay. Scott, the property manager, was very friendly and responsive to questions via text/calls. He gave a detailed overview of the property and its features upon check-in. Check-out was equally as smooth. The neighborhood is great; while the location appears a bit far from the downtown area, it is only a short drive there, and it is easier to access the interstate as well as the highway to Joshua Tree National Park from this part of Palm Springs. One thing to note is that this home is directly in the flight path of Palm Springs International Airport; the planes start taking off at about 5:30am and continue until about 9pm (there aren't as many flights as airport in a larger city, but around 20 per day, at least during early February when we stayed here). If early mornings wake-up calls aren't your thing, bring earplugs as you will hear them flying overhead. Overall, we would definitely stay here again and recommend this property to anyone looking for a relaxing, well-kept, and comfortable place to stay in amazing Palm Springs, CA! Great property and great rental experience! The property was in great condition and matched the descriptions as promised. The check-in and check-out process was easy and the property management team quickly responded with any questions we had during our stay. I would definitely stay at this property again! PS Enamor was a very cool place for 3 couples (and a dog!) to spend a week in Palm Springs. We spent most days lounging by the gorgeous pool and the hot tub. The pool heat is a must in the winter months, and the fire pit is perfect. We cooked many meals at home and dined al fresco for breakfast and lunch. The kitchen amenities were top-rate, and the house was impeccably cleaned. We also loved that one of the couples could bring their dog! Two small knits: 1. The city of PS has a very strict noise ordinance --> no outdoor amplified music. This was frustrating at first, but didn't dampen our fun. Just something to be aware of if you are planning to spend significant time by your pool. 2. Two of the bedrooms have gorgeous ensuite bathrooms and are nice and large. The third is much smaller and has a bathroom across the hall. Wasn't a big deal for us, but just required some upfront negotiation. Overall, we had an amazing week of relaxing in the pool/hot tub, exploring Palm Springs, and relaxing. Highly recommend this gorgeous house! Fabulous Wonderful time here with our two small children. House is lovely, well equipped, great location. Property management team @ Relax PS was phenomenal. Absolutely only negative for this house is it is in the flight path, but there are only a few flights per day. We would come back and reserve this house again in an instant. Thank you to Scott and his team, particularly Jonathan. Beautiful home, as clean and pristine as the pictures. The kitchen has everything you need. The towels and sheets were like a 5 star hotel, which is a big deal for us. The pool, spa and outdoor seating were perfect to lounge and relax. The big beautifully kept yard was such a bonus for us. Who knew you could still "play outside" with you adult/grown kids?! We had so much fun and we will definitely be back. Thank you, RPS; you were a perfect host! Gorgeous property for a memorable Palm Springs visit! We loved everything about this home, including the creative decor, high end finishes, well-appointed kitchen, pristine pool/spa and landscaping, quiet location on a pretty street with a view of Mt. San Jacinto, and the airy, spacious floorplan. This one is a real winner in all categories! Even better than the pictures. Highly recommend! A Wonderful Week Our party of five enjoyed a delightful week in this like-new, mid-century home. It was spacious, and had all the amenities needed for a comfortable stay. Pictures on the website were accurate and reflect the mid-century decorating. Having sitting areas on both sides of the house provided opportunities to enjoy either the sun or shade, depending on preference. And the outside fireplace was a real plus for the cool nights. The kitchen was clean, modern and very well-stocked. We opted to pay to heat the pool and enjoyed the 87 degree pool temperature. The hot tub was terrific too. Check in/out was easy; Very good communication with Scott, the property manager, who met us on arrival. He was also available by phone, text and email. Scott provided tips on restaurants and places of interest around Palm Springs as well. The only suggestion I can make is that acrylic wine glasses would be nice for around the pool area! Would definitely stay here again! Perfect We had such a good time at this perfect vacation rental. It was modern, well equipped, great floor plan, comfortable beds and couldn't have been more perfect for us and our guests. Scott Fields met us at the door when we arrived and was johnny on the spot when we asked something of him, which were minor details but he took care of them immediately. The neighborhood was quiet and we felt very safe and secure here. Simply loved the place! Desert retreat, We were met by Jonathan after a 9 hour drive from the bay area. Exhausted, but instantly ready to explore the area after getting the complete run down on the property as well as lots of restaurant and desert area recommendations. The home is stunning, yet comfortable, with a well appointed kitchen that is simple to operate. We spent part of every evening enjoying the hot tub and fire pit. Breakfast poolside is a must, the neighborhood is quiet and serene with mountain views. The home is situated at the end of a cul-de-sac, the surrounding homes are the same style with a modern, sleek feel. We were less than 10 minutes from downtown PS and the vibrant restaurant row. We recommend without reservation! The house and Relax PS were amazing! Any question or problem was addressed immediately. They are extremely professional and would highly recommend the house and company to anyone. Thanks for the fantastic getaway! Our stay was absolutely wonderful! Such a great house and would totally stay again for a future vacation! The house was everything I wanted and more. The perfect size, stunning house, very relaxing and felt like home! Thank you Relax Palm Springs for making our stay effortless and memorable! Amazing property! glad we stayed here. This place is beautiful. We loved our stay here. Everything in the property was clean, beautiful, and in working condition. We enjoyed our time outside and in the pool, used the grill every night, used the kitchen every day, and pretty much everything else the property had to offer. We had absolutely no issues or problems. Scott was great, he was very flexible and accommodating to our every needs. Thank you so much for a super simple process, a great property, and a joyful vacation. Gorgeous, elegant property convenient to downtown Palm Springs. First of all, Scott is an excellent host - great communication beforehand, met us when we arrived and reviewed house rules and a map of the area with useful locations noted. The house itself is beautiful with an open, airy feel and impeccably decorated. There were only two of us, but the house has three bedrooms and baths that could accommodate a family or three couples. The kitchen is well appointed and had everything we needed to prepare meals. The pool and outdoor area are comfortable and a great space for relaxing. I'd never been to Palm Springs before and didn't realize how windy it got at night, so that was a bit of a surprise, but in no way a reflection on the house, of course! We just had to be careful because it would blow your drinks over while we were enjoying the pool. 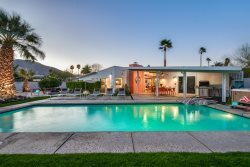 We would highly recommend this home as a wonderful place to stay in Palm Springs and hope to visit again! I felt our stay at the property was nothing less than a dream weekend. I had seen the pictures online for a few weeks before our stay. Then, when we arrive and I walked through the front door, everything was just as the pictures displayed. The management has really thought through several things which has made our stay care free and very relaxing. The kitchen was fully stocked, and with quality cooking products. The bedrooms were beautiful and beds very comfortable. The house had air conditioning that worked really well a pretty fast internet connection as well. Everything was very neat and organized which allowed for us to be able to find everything and then put everything back when we were done. We cooked on the grill outside almost every night and made some really delicious meals. Our overall stay was amazing. I honestly have no complaints. I would highly recommend this property and I will hopefully be back again! Thanks for the great weekend!! Fabulous. We enjoyed this home with all the comforts you could ask for while vacationing. The kitchen was fully equipped with everything you could possibly need. This home is near several shopping locations and restaurants. I would highly recommend this home and would definitely return when in this area again. The New Palm Springs. After doing mid-century our last trip, we passed these newly constructed homes just steps away from some of the original Alexander's in Racquet Club Estates. This updated take on mid century was refreshing and incredibly comfortable. As much as we wanted to hang out in fabulously designed house, we could not pull ourselves away from outdoor spaces, which made this a great home for relaxing and enjoying the warm summer morning, days and nights. Of course when we had to finally wrap up the outdoor festivities, nothing was missed inside. The kitchen was well stocked and made the dinners a joy to make and eat and the living room and bedrooms were lovely, well designed and incredibly comfortable. If you have the chance to book this property, do it today, since I am sending all my friends to book this one for their Palm Springs getaways, so you might find it booked!